Sorry. 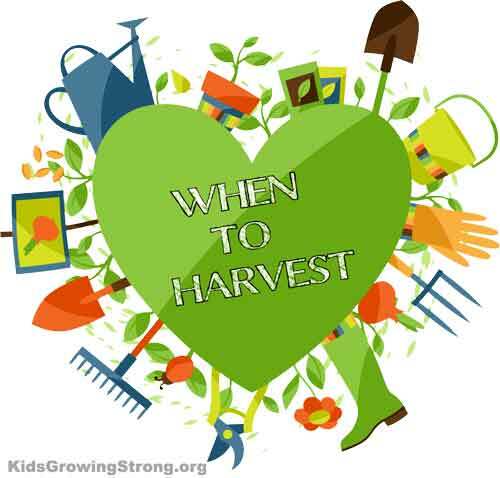 There are no precise guidelines as to when to harvest your vegetables. Every type is different and has their own requirements. Make sure you keep the pack instructions so you have a clue. There is a rule of thumb to guide you. Most vegetables are harvested just before full maturity, for maximum flavor and the most pleasant texture. Beans – Pick before the you can see the seeds bulging. they should easily “snap” off the plant. Beets– Some people like them small and some like them big. They can be picked any time after you see the beets shoulders protruding at the soil line. Broccoli– We eat the unopened flower buds of broccoli, so check frequently, especially as the weather warms up, to ensure you don’t let the flower heads bloom. Harvest when the buds are about the size of a match head… much smaller than the heads youwill see in the supermarket. Carrots- Carrots can be tricky. The tops of the carrot will show at the soil line and you can guess what looks best for your tastes. If the diameter looks good, chances are the length is fine too. But you will need to pull one to be certain. Carrots can be left in the ground once mature. A light frost is said to improve and sweeten the carrot’s flavor. Cucumber– Cucumbers and zucchini squash seem to race eachother to the harvest. Check daily and harvest young. Timing and length will vary with variety. The cuke should be firm smooth. Over-ripe cucumbers can be very bitter or pithy, even before they start to turn yellow. Kale– Kale leaves can be picked all season long. They should be a deep green with a firm, sturdy texture. Kale flavor is best in cooler weather. Pumpkin– Harvest your pumpkins when the color is the same all over the pumpkin and the rind is hard. Harvest pumkins by cutting them off the vine with a sharp knife or a pair of shears leaving 3-6 inches of the stem attached to the fruit. Washh the pumkin with soap and water and store in a cool, dry place. Squash– Squash differs from variety to variety. Summer squash has soft edible skin and is harvested at the size that is right for you. Most people prefer them when they are the size of a cucumber. The skin is very delicate and if damaged, the squash will spoil more quickly. Winter squash has a hard shell instead of a soft skin so it grows in cooler weather. Again, size is the a matter of taste. Some people use fingernail method to tell if the squash is ready; if you can’t mar the skin with your finger nail, the squash is ready to harvest. But cutting into the skin of a squash that is not ready to pick leaves an open cut for dirt and disease to enter, so it is not a good idea. When you harvest the squash, leave a few inches of stem attached. This will lengthen the storage time.